In this lesson, we will learn how to find missing numbers in number patterns of two-digit numbers. Complete the following pattern: ﬁ v e e i g h t , , , . What are the missing numbers in this sequence: 1 0 , 2 0 , , 4 0 , 5 0 , , ? Complete the following pattern: 2 9 , 3 1 , , , 3 7 . Complete the following pattern: 5 , 1 5 , , , , 5 5 . The summer Olympic Games occur every four years; one particular Olympics Games took place in 2004, in which years did the next three occur? Complete the following pattern: , , 3 , 4 . Complete the following pattern: 1 , 3 , , . Complete the pattern 4 2 , 4 8 , 5 4 , , . Complete the following pattern: 1 0 0 , 9 0 , , 7 0 , . Complete the following pattern: , , 8 , 7 , 6 , 5 , 4 , 3 , 2 , 1 , 0 . 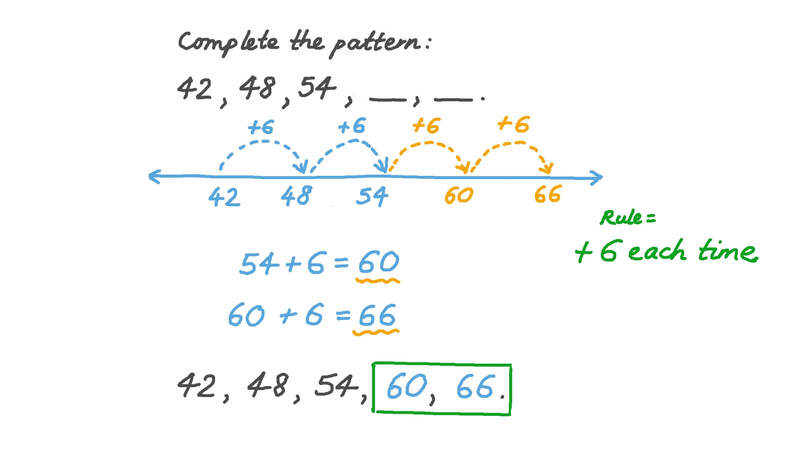 Complete the following pattern: 8 , 6 , , . Complete the pattern: 3 5 , 3 1 , 2 7 , , . Complete the pattern: 4 , 9 , 1 6 , 2 5 , , . Complete the pattern: , , 1 5 4 , 1 6 3 , 1 7 2 , , . Complete the pattern: 1 1 7 , 1 1 4 , 1 0 9 , 1 0 6 , 1 0 1 , , , . Complete the pattern 1 8 7 , 1 8 4 , 1 8 1 , 1 7 8 , , , . Complete the pattern: 4 2 0 , 2 1 0 , 1 0 5 , , . Complete the pattern 4 8 , 5 7 , 6 5 , 7 2 , , , . Complete the pattern: , , 7 5 , 3 7 5 , 1 8 7 5 , , . Complete the pattern: 5 9 , 6 3 , 6 5 , 6 9 , 7 1 , , , . Complete the pattern: 6 , 6 , 1 2 , 1 8 , 3 0 , 4 8 , , . Complete the pattern: 5 , 2 0 , 8 0 , , , . Complete the pattern: 3 , 3 3 , 3 3 3 , , , . What comes next? 7 9 , 6 9 , , , 3 9 .